The Monk Seal is one of the largest seal species. A newborn pup may weigh from 15 to 20 kg and be of 90 to 100 cm long. Adult Monk seals reach a good 2.6 meters, while the males weigh up to 400kg and females up to 300kg. The coloration of the upper side of the body is uniform brown and the lower underside is a spotted yellowish-white. The forelimbs have well-developed flippers but the toes of the hind limb are so well elongated that look like fish-tail. Monk Seals can dive up to 125 meters, holding their breath for 15-20 minutes! While mating occurs in water, birth takes place in well-secluded caves, mainly between September and November, after a 9-10 month pregnancy. Monk Seals live in small groups of which social structure is not well known. One may distinguish a male to a female, by the scratches and wounds that males usually have on their heads and flippers, from fights with each other while competing “for the heart” of a female. Monk Seals feed on fish, octopus and lobsters and it is not rare at all that they might “steal away” fish from nets. In their effort to get the fish off from the nets, Monk Seals may get entangled in the fishing gear and end up asphyxiating. Accidentally lessening the fishermen’s livelihoods by destroying the fishing nets, Monk Seals are sometimes treated in a competitive way by humans and face deliberate killing. Along with habitat loss, interaction with fisheries is the most important threat to the survival of the species. 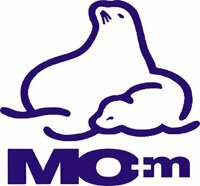 In Greece, MOm/The Hellenic Society for the Study and Protection of the Monk Seal, a non-governmental environmental organization, has been working for more than 18 years for the protection of the marine ecosystem through the conservation of the Monk Seal. MOm’s research, conservation and public awareness projects expand throughout Greece, including the Kimolos-Polyaigos island complex. In case you see a sick, wounded or dead Monk Seal, please contact MOm’s specialized rescue team at 0030 210 52 22 888.